But as the Days of Noah were | Looking for that Blessed Hope! We are all Children of God?? 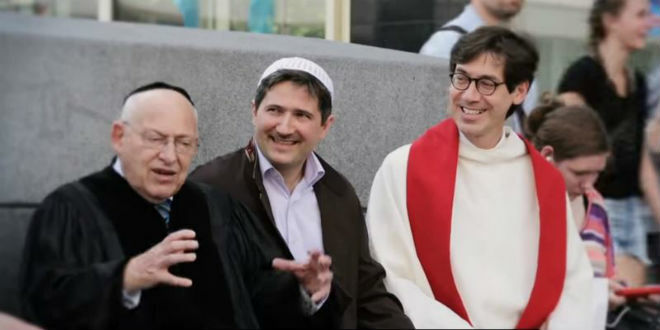 While there have been many interfaith events lately, one is of extreme importance as it will be held for the month of September in the city of Jerusalem; God’s city. For a month, representatives from all three religions will offer a series of discussions at the Jerusalem Music Center, with options to pray three different times per day in Arabic, Hebrew and Coptic at the 2016 Mekudeshet Festival. We are that much closer to the coming one world religion where the false prophet will appeal to all walks of religion speaking of which, the pope has made “The Pope Video network”. The bible refutes that we are all children of God. Know ye not that the unrighteous shall not inherit the kingdom of God? Be not deceived: neither fornicators, nor idolaters, nor adulterers, nor effeminate, nor abusers of themselves with mankind, Nor thieves, nor covetous, nor drunkards, nor revilers, nor extortioners, shall inherit the kingdom of God. 1 Cor. 6:9-10. This paper was originally written over a year ago, but the timing is more important now than ever. Be sure to watch the recent outstanding video at the end. You won’t hear it like this anywhere else. It is the coming great deception. We perceive only a portion of the external world; even then, some of it may be incorrect. Our reality is comprised of only what we can perceive. Paul promises the believer a fuller picture of reality after we leave earth. “For now we see through a glass, darkly; but then face to face: now I know in part; but then shall I know even as also I am known 1 Corinthians 13:12. Paul says “For we wrestle not against flesh and blood, but against principalities, against powers, against the rulers of the darkness of this world, against spiritual wickedness in high places Ephesians 6:12. There are just some things in this life that we do not fully understand and will not understand completely until we are present with the Lord.